Given all this, a coalition of foundations has raised pledges of $330 million to help shore up pension funds, on one condition: that the final bankruptcy settlement prevent any art from being sold. The DIA, in other words, would be left intact. Three hundred million plus, unfortunately, is a drop in the ocean when you consider that the city and its pension funds are billions in debt. The state was called upon to help. Yesterday, Gov. Snyder responded. He wants the state to add to the effort by committing $350 million to the pension funds, quote “to help minimize pension cuts, to help protect art.” For those of us who cannot imagine life without the DIA, this was gratifying. But now for the cold shower: There are more strings attached to this than at a puppet show. And even though the governor made this announcement with the Republican leaders of the House and Senate, there is no guarantee they are going to be able to deliver the votes to pass this. In fact, I think the odds are very much against it. There is little love for Detroit among legislators from outstate Michigan, especially Republicans. There is even less enthusiasm for anything that sounds like a bailout. The governor took great pains yesterday to say this wasn’t a bailout, but that’s what it looks like. Consider this: Everybody from Escanaba to Ecorse has a stake in repairing our atrocious roads. But last year, the governor totally failed to get these lawmakers to appropriate the money needed for road repair. Now, he expects them to ante up to help Detroit pension funds and art? For many GOP lawmakers, supporting this would be inviting a Tea Party challenge in an August primary. By yesterday afternoon, some were already denouncing the deal. The fine print on the governor’s offer says the state would only provide this money as part of a settlement of the entire bankruptcy, and that retirees and city worker unions would have to sign on to the deal. And some are still fighting the bankruptcy itself. I think the best thing would be for U.S. Bankruptcy Court Judge Stephen Rhodes to rule that the DIA is off the table in any proposed settlement, since the art and the institution are not solely a city asset. Indeed, he seemed to hint at that yesterday. Still, it would be nice if that money on the table could be added to the city’s troubled pension funds. My guess is that this saga is far from over, and that many twists and turns lie ahead. Governor Rick Snyder has proposed committing up to $350 million to help mitigate cuts to Detroit pension benefits – as well as keep assets of the Detroit Institute of Arts off the auction block. The state’s offer would play out over 20 years and would match money raised from private donations to make sure DIA paintings, sculptures, and other works of art don’t get sold off to pay pension benefits that are central to the bankruptcy negotiations. Snyder said one of the conditions would have to be creditors dropping any legal claims to DIA asserts. The governor says he hopes the state’s offer will help move the city through bankruptcy more quickly, which would be a good deal for the state. The proposal must still be adopted by the Legislature. Republican leaders say hearings will begin very soon. The governor’s offer came as Detroit bankruptcy judge Steven Rhodes refused to allow an evaluation of DIA assets to go ahead. Detroit’s creditors could still challenge the plan in bankruptcy court. The state’s share would match contributions from private donors. It would come from money the state gets annually from the 1998 nationwide settlement between states and tobacco companies. The plan will be part of the governor’s budget proposal to be delivered Feb. 5. Gov. Snyder and Sen. Majority Leader Randy Richardville (R-Monroe), and Speaker of the House Jase Bolger (R-Marshall) announced that they plan to support legislation aimed at saving Detroit pensions and DIA art. 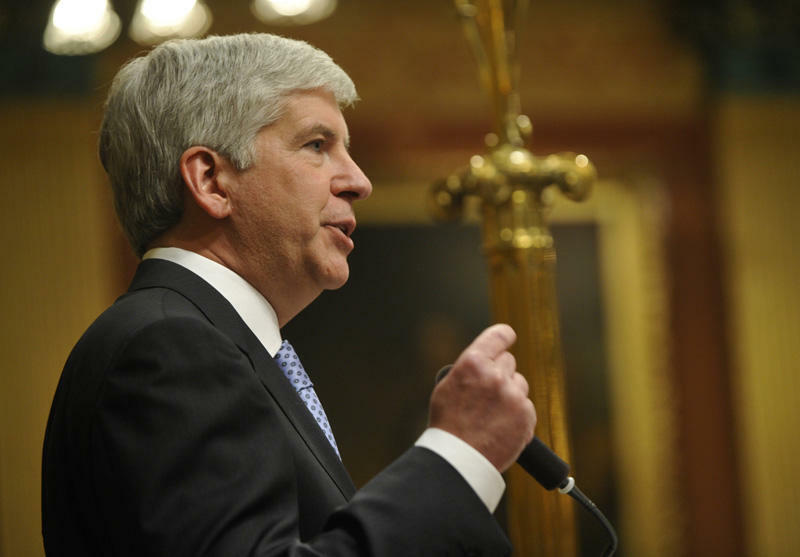 Snyder said there would be "strict conditions on any funds allocated towards the settlement." 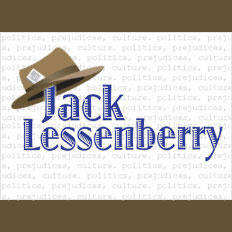 Money from the state, he said, must solely go toward pensions and that "independent fiduciaries manage the pension funds going forward." "The level of proposed investment by the philanthropic community and the State will go far in helping reach a timely and positive resolution of the City's financial emergency. A mutually agreed resolution to outstanding bankruptcy issues is the best way to help the City restore basic and public safety services to its 700,000 residents. It is now time for the remaining parties to set aside the bargaining rhetoric and step forward and join this settlement to help this great city regain its footing and become once again an attractive place to live, work and invest." MPRN will have more for us later. Many political deals have been dubbed a "grand bargain." 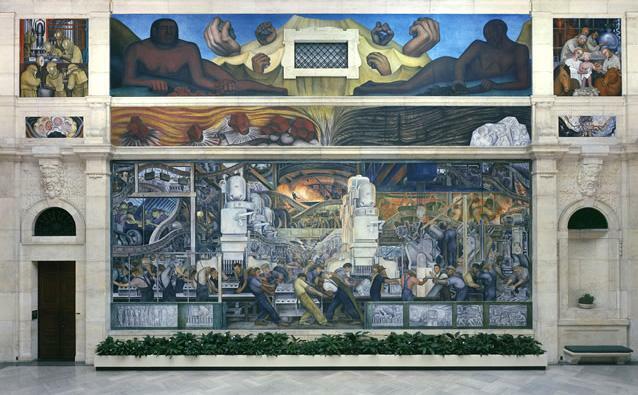 This "grand bargain" involves private money and potential state money to save Detroiters' pensions and the artwork at the Detroit Institute of Arts. "We are advised that the governor of the State of Michigan, Rick Snyder, intends to announce soon his support for significant state participation in the plan to help protect the pensions of city of Detroit retirees, support the DIA, and revitalize the city in the aftermath of the bankruptcy. 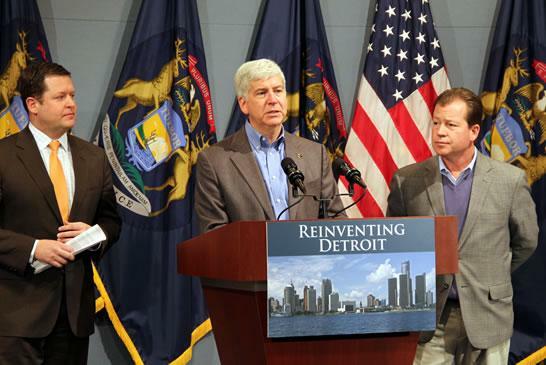 The governor has indicated that he will engage with the Michigan Legislature to help secure this support for the plan." Gov. Snyder is expected to hold a press conference at 3:30 announcing more details of the plan. He'll be joined by Sen. Majority Leader Randy Richardville (R-Monroe), and Speaker of the House Jase Bolger (R-Marshall). It's a sign that these legislative leaders are supportive of the plan. Chief bankruptcy mediator Judge Gerald Rosen struck a deal with private foundations that pledged more than $300 million to help Detroit solve the pension/art problem. With that money pledged, state leaders took note and are deciding whether to try to match the money pledged by the foundations. Earlier reports stated that the plan calls for sending Detroit $350 million over 20 years. We'll find out more details later today. How Michigan legislators will react to this plan is anyone's guess. In their statement, federal mediators urged that "all parties approach the issue with an open mind." Foundations and individuals have stepped up to pledge big dollars to the struggling city of Detroit, and now Gov. Rick Synder is floating a plan to send Detroit $350 million over 20 years. The Detroit Free Press named an anonymous source when reporting the plan this morning. Michigan Senate Majority Leader Randy Richardville (R-Monroe) confirmed today that Snyder has floated the plan.